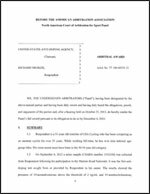 The United States Anti-Doping Agency (USADA) announced Friday the decision by a three-member panel of the American Arbitration Association (AAA)/North American Court of Arbitration for Sport (CAS) arbitrators finding Tammy Thomas of Colorado Springs, Colo., an athlete in the sport of cycling, committed a doping violation involving the prohibited substance norbolethone. Thomas, 32, tested positive in an out-of-competition test in Chula Vista, Calif. on March 14, 2002 for norbolethone, an anabolic agent, which is a prohibited substance under the Union Cycliste International (UCI) rules and The Olympic Movement Anti-Doping Code. The UCI is the international federation for the sport of cycling. Thomas will be disqualified for life from competition, beginning on Aug. 31, 2002, the day after the arbitration ruling. Thomas tested positive for an elevated testosterone level at the 2000 U.S. Olympic Trials and received a one-year suspension from USA Cycling and UCI competitions. Per UCI rules, the sanctions for a second doping offense involving anabolic agents include lifetime suspension. 500-meter time trial (ninth) events. USA Cycling, the national governing body for the sport in the United States, will carry out the sanction. The CAS panel has indicated that USADA will receive its findings at a later date. USADA will release the findings on that date. This is the 22nd announcement issued by USADA during 2002. USADA became the independent anti-doping agency for U.S. Olympic, Pan Am and Paralympic athletes on Oct. 2, 2000. USADA is the independent anti-doping agency for Olympic sports in the United States, and is responsible for managing the testing and adjudication process for U.S. Olympic, Pan Am and Paralympic athletes. USADA is equally dedicated to preserving the integrity of sport through research initiatives and educational programs.